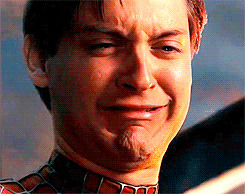 This is an animated gif of actor Tobey Maguire crying. This is from one of the Spiderman movies, where he played Peter Parker aka Spiderman. Maguire is from Santa Monica, California. Knock, Knock! Who's there? It's reality! I'm not even mad. That's amazing. Maurice Moss - Popcorn "GO"